Now that we’re finally seeing some buds on the trees here in Washington, DC (yay! 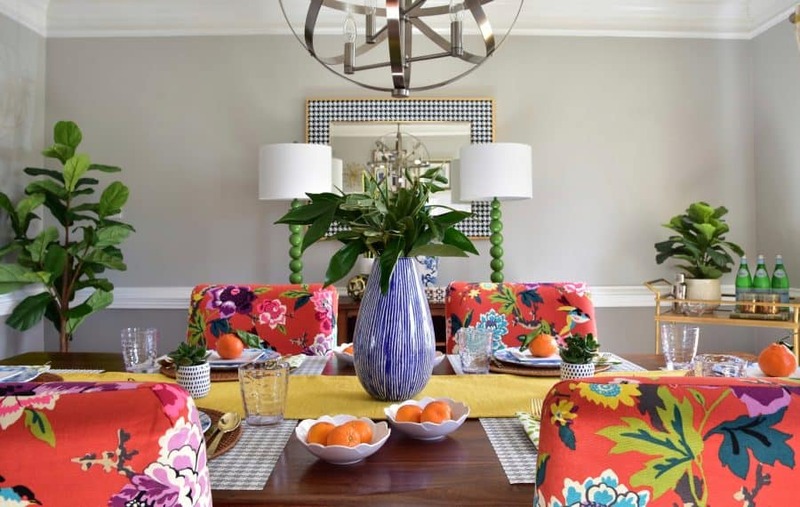 ), I’m excited to share a few spring decorating ideas for your home. If you’re ready to shake off the winter blues and spruce up your house as the warm weather rolls in, then today’s your lucky day. Because not only am I sharing spring decorating ideas with you, but 15 stylish ladies (including yours truly!) 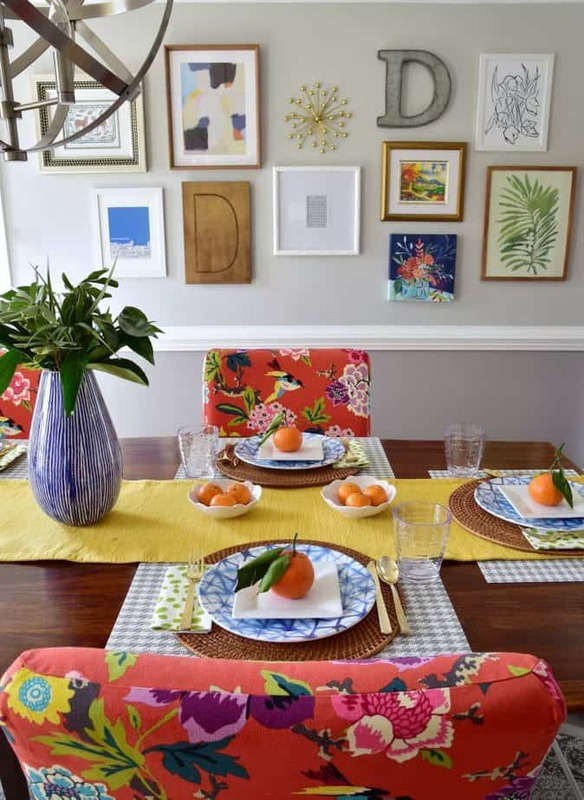 are spilling all our seasonal decorating tips and tricks as part of the It’s a Colorful Life 2019 Spring Home Tour. 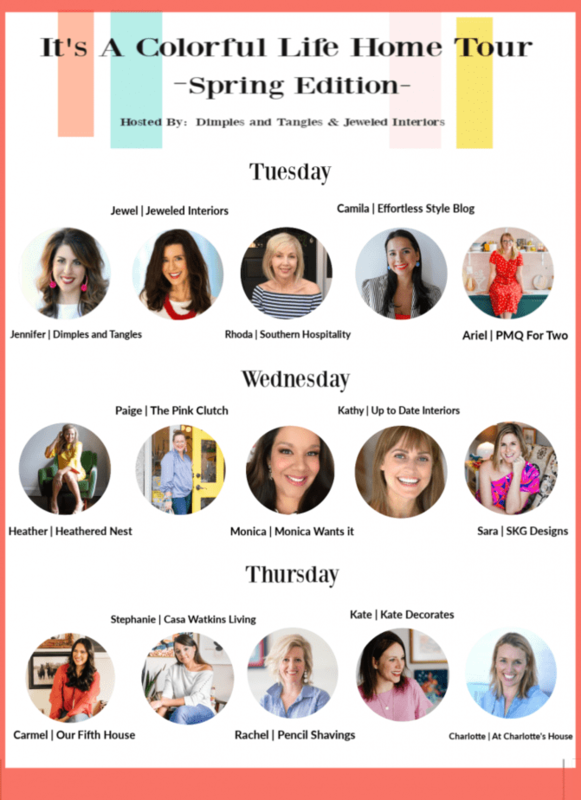 It’s hosted by my talented friends Jewel of Jeweled Interiors and Jennifer of Dimples & Tangles, and I’m so grateful they invited me to be part of it. 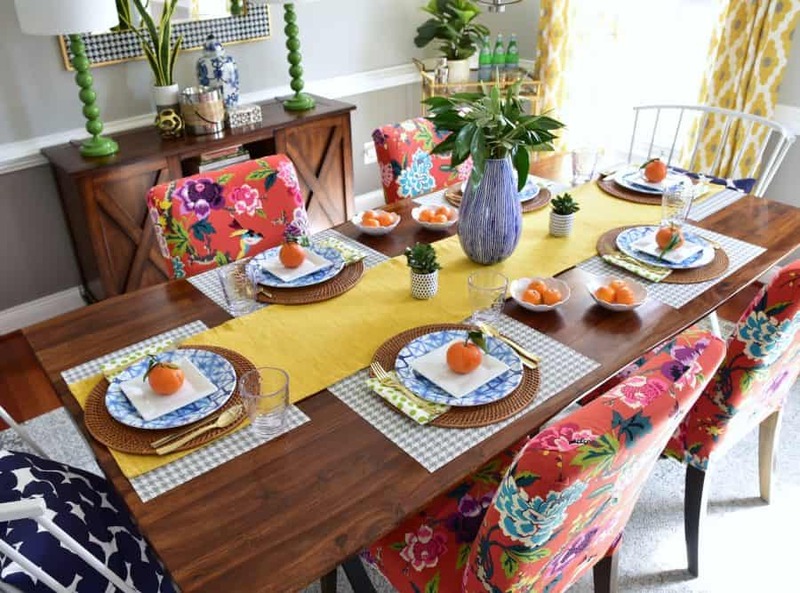 So here’s what you need to know: Over the course of three days, all 15 ladies participating in the tour are writing up one post that’s chock full of their best spring decorating tips. And they are good, you guys. Like real good. If you’re joining me from Pencil Shavings Studio, welcome! I’m so thrilled to have you and I hope you get some good spring decorating inspiration from my tips below. For the full list of everyone participating in the tour and the links to their blog posts and amazing tips, check out the list at the bottom of this post. This post contains affiliate links. Thanks for your support! For my full disclosure policy, click here. Let’s be real: As soon as the weather warms up, life gets really busy. There’s sports practices and neighborhood barbecues and…. But I bet you can still find a free 10 minutes here or there, right?! Then you can “decorate” for spring, my friend. And by “decorate,” I mean using my easy spring decorating ideas to freshen up your home, and fast. Most of my tips will take 10 minutes or less of your time, and all of ’em are easy on your wallet. After that, sit back, put your feet up, and enjoy your pretty house. And did I mention all the compliments you’ll get from your guests? Look at you, Martha Stewart. We can call you Martha, right? 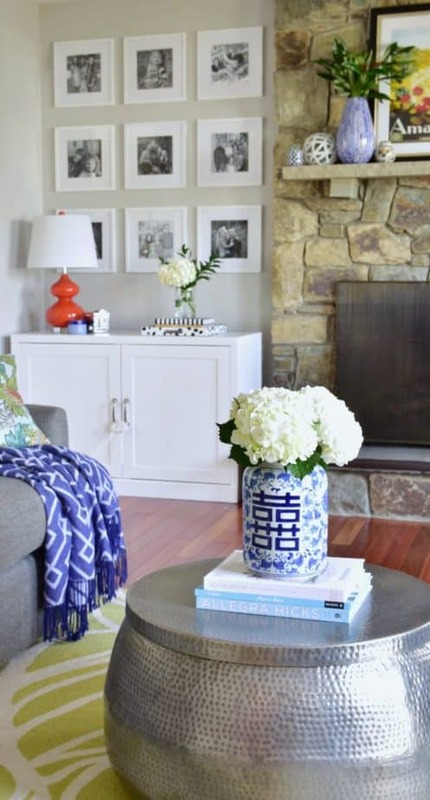 Fresh flowers are always an easy game changer for any room in your home. Sure, they’re available year round, but springtime ushers in some of my favorite kinds of blooms like tulips and hydrangeas. I grabbed a bouquet of hydrangeas at the grocery store this past weekend and split up the bunch between a couple different vases. And then I grabbed a single hydrangea stem and a bit of greenery and popped it into a clear vase. Wanna know a secret? My “vase” isn’t a vase at all. It’s the bottom portion of an apothecary jar I once used for a birthday party candy bar. That said, don’t be afraid to embrace florals other than the “standard” spring flowers. Sure, everybody goes gaga for tulips, but the lush greenery that’s usually dubbed as “vase fillers” in the corner of the flower department can be just as beautiful as a collection of more colorful stems, plus they’re generally cheaper. My local Whole Foods Market has THE best “vase fillers” right now for $6 a bouquet. They are amazing and I buy two every time I go to the grocery store. Right now I have one bouquet in our dining room and the other on our fireplace mantel in the living room. Here it is in our dining room! See what I mean?! My favorite alternative to a bouquet of flowers is a pretty bowl filled with fruit. It’s easy, inexpensive, beautiful, and healthy (for those moments when, you know, your kids start eating said centerpiece). Pick one type of fruit — my favorites are green apples, oranges, and lemons — and fill ‘er up. You’ll instantly brighten up your table, and your kiddos will have a delicious snack waiting for them within arm’s reach. EVERYTHING ON OUR TABLE IS KID FRIENDLY. Yep, that’s right. Nothing here (except my vase in the middle of the table) will break. It’s all plastic. And for those of us with toddlers around, that is the best news ever. If I had to choose just one colorful item to freshen up family meals, I’d choose a fun set of melamine plates. I can’t say enough great things about melamine dishware: It’s durable, kid-friendly (Nope, your toddler can’t ruin this! ), affordable, and comes in tons of great styles. The blue and white shibori-printed plates I bought last year from One Kings Lane are my FAVORITE. We use them year round. And they look so pretty with lots of other colored and patterned dishware, so mix and match until your heart’s content! And P.S. — That flatware? I scored an entire box of it — 120 pieces, to be exact — at Michael’s for a mere $12. Helloooooooo, new party staple. I’m obsessed. 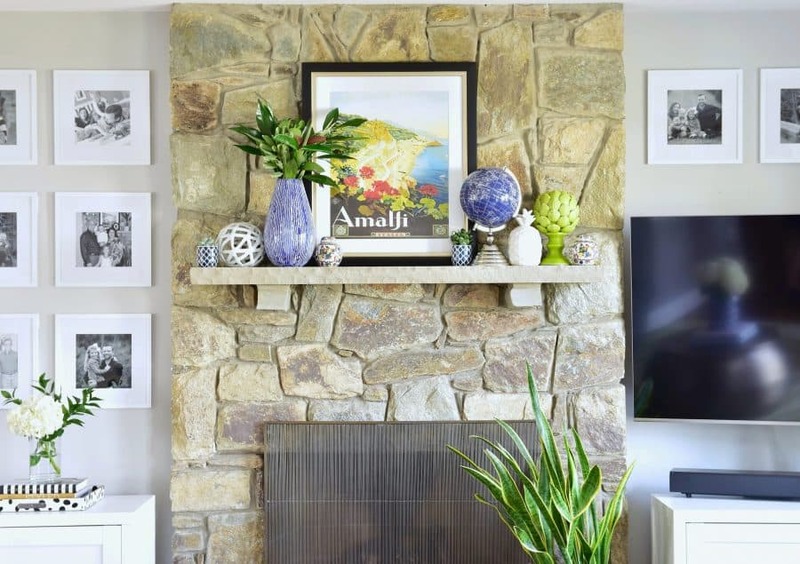 There are so many great wall art shops that sell digital downloads these days, which means that there’s really no excuse not to refresh your wall art once in a while. 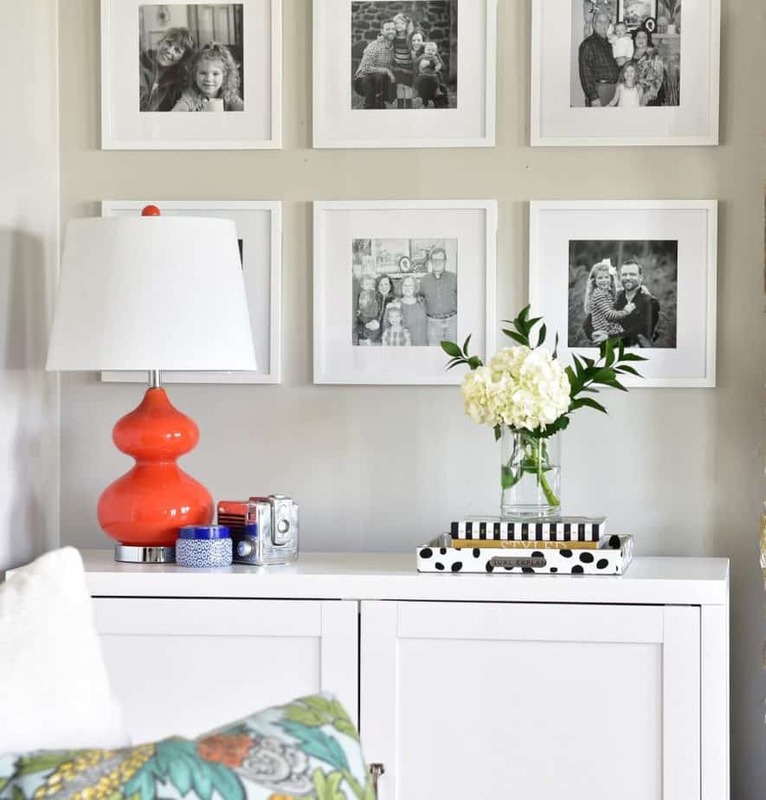 And there’s no better time than spring to add another pop of personality to your walls! I’ve got an entire post on my favorite shops that offer downloadable wall art prints. While most of the artwork you see here in our dining room isn’t the digital download/printable variety, it was still quite affordable. 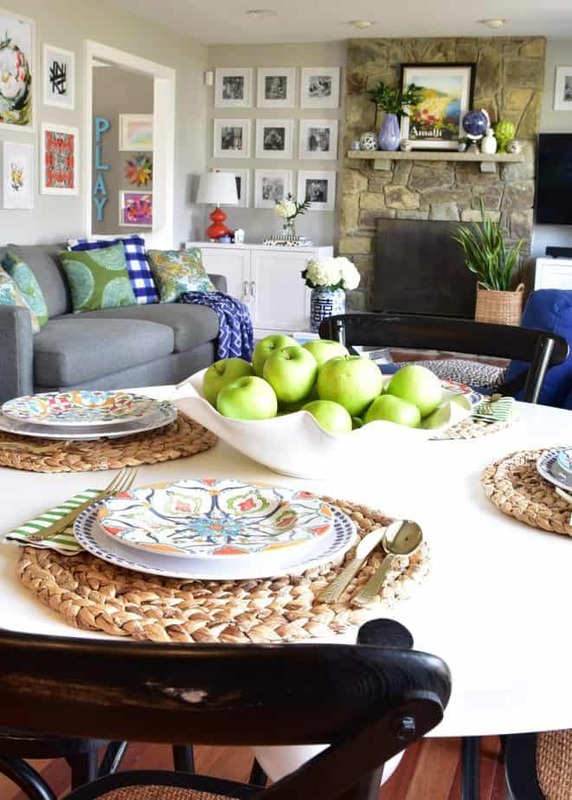 Springtime is a great excuse to bring more natural and organic textures into your home decor to make things feel light and airy. 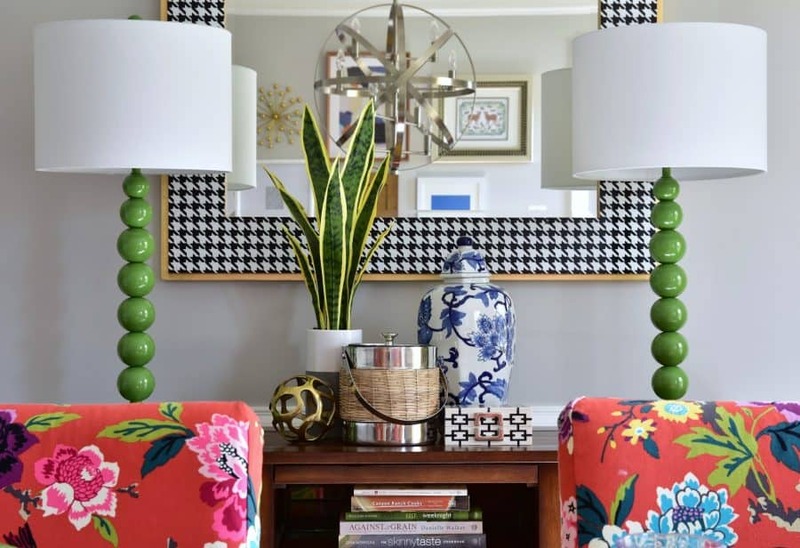 Think about materials like rattan (trays, baskets, planters) and wood (serving bowls, accent tables, coffee table trays). I snagged this cute ice bucket with a rattan accent at HomeGoods for $10. And how gorgeous does it look in front of our new black and white Varaluz mirror? I am seriously obsessed with that mirror, you guys, and it was far more affordable than most of the “statement mirrors” I typically come across. Here’s one more photo of the mirror — I couldn’t resist. Don’t forget to pop over to At Charlotte’s House — she’s the last “stop” on the spring home tour and she’s got a great post waiting for ya. loving all of the pattern play Kate! So many fun colors! It’s all so good! 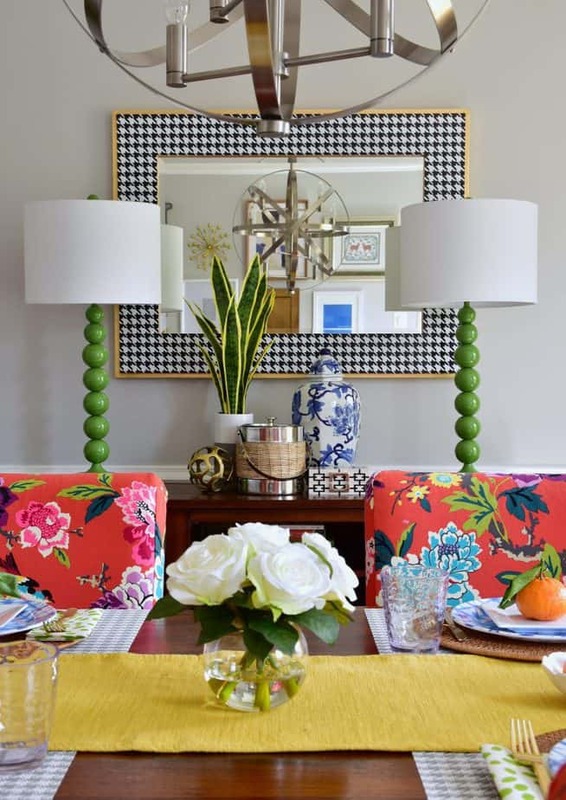 Loving the patterns in the dining room! You are so sweet, Kathryn! Thank you! 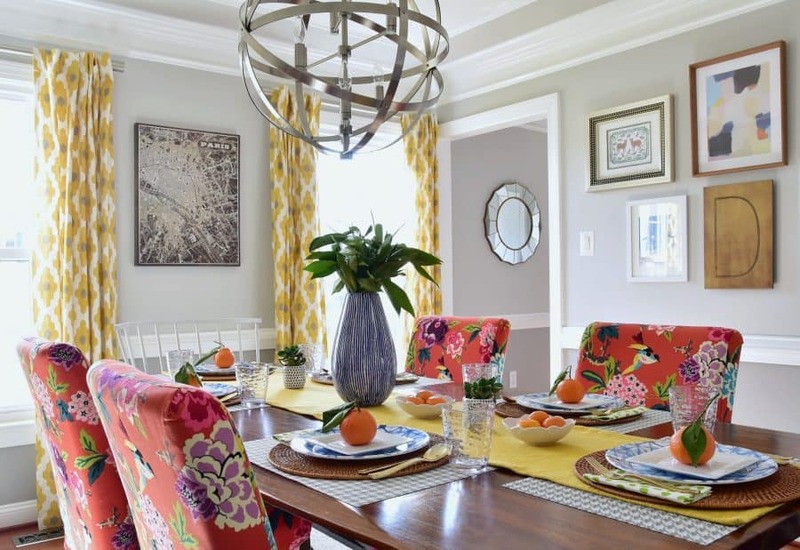 Can’t get enough of your dining room! Those chairs really pop! Thanks, lady! Those chairs are my fave…so bummed they discontinued the fabric! 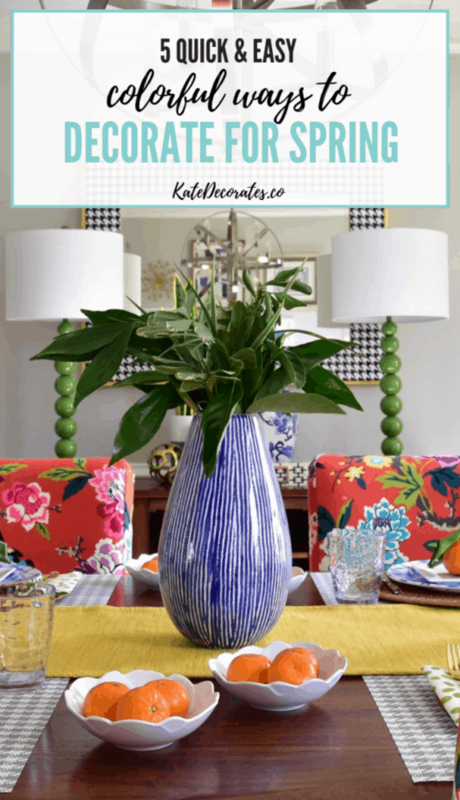 Such great tips, Kate, and your home loos beautiful for Spring! Thanks for joining us for the tour! Thank you, Jennifer! It was so much fun to participate and amazing to see everyone’s homes decorated for the season. GORGEOUS KATE! 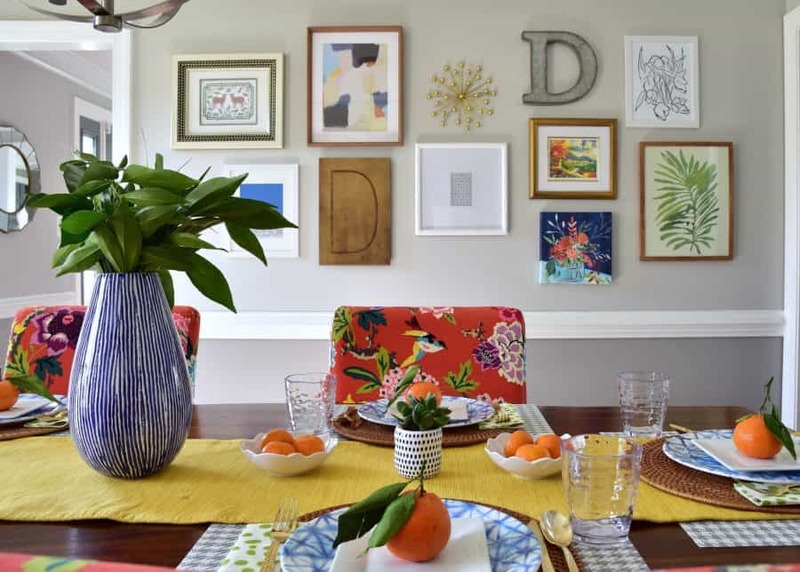 Loving all of your bright dining room pieces and that art!!! Such a colorful space and full of spring vibes.